In a fantastic hybrid of edible architecture and temporary summer pavilion, architect Caroline O'Donnell has proposed Bloodline, a free-standing, self-consuming grilling shelter. [Image: Sectional model through the preparation bench, Bloodline pavilion by Caroline O'Donnell; Bloodline is supported by the Akademie Schloss Solitude]. Bloodline is the outcome of O'Donnell's 2007 fellowship and residency at Akademie Schloss Solitude, a grant-making and residency institution housed in the late-Baroque "Solitude Castle" near Stuttgart in southern Germany. According to O'Donnell, "The guides at Schloss Solitude could not understand why I wanted to see the service spaces, and tried to convince me that they were not interesting. I kept telling them in bad German that I was an architect and therefore interested in uninteresting spaces, but that seemed to cause more confusion." Interestingly, O'Donnell noticed that at Karl Eugen's main palace, Ludwigsburg Castle, the formal rooms are arranged around the edge, concealing a rabbit warren of service spaces in the interior. O'Donnell explained that when she finally gained access to a fire-space, she noticed "the effects of this small-scale and contorted space on the body," but she was most fascinated "by this idea of the fire-space as a window, through which the stooping servant had a rare window into the lives of his masters"—and, in some ways, a more complete or privileged understanding of the space of the palace as a whole. 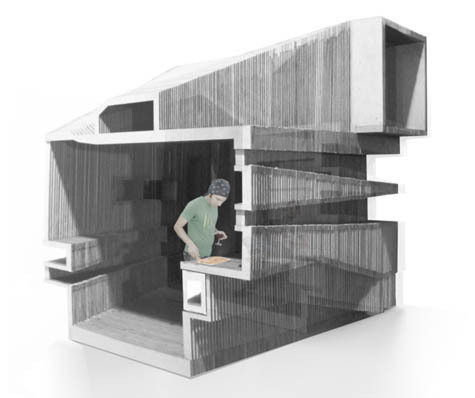 So, back to the barbecue pavilion: O'Donnell's Bloodline proposal would use 360 bags of grillholz (German barbecue wood sticks) as the cladding—enough for a summer season, or ninety barbecues at four bags per cook-out. As July fades into August, and then into September, the pavilion will gradually be dismantled: the architecture's fiery function will lead it to literally consume itself from the outside in. This is an incredibly poetic literalization of the shelter's function: architecture parlante at its finest. The pavilion also plays on O'Donnell's initial fascination with Solitude's squished fire-spaces. Bloodline begins the summer as a perfect, platonic cube, but gradually grills itself down to an awkwardly shaped frame that mirrors a section through the original fire-space. In other words, through use, the mini-barbecue palace will reveal its contorted, service-space origins—a slow, season-long process of revelation. Like Solitude's original fire-spaces, which servants had to bend down and crawl to enter, the Bloodline barbecue pavilion is only designed to fit one person. And, as in the originals, that one person—the servant or barbecuer-in-chief, depending on how you look at these things—has a unique, more omniscient view. 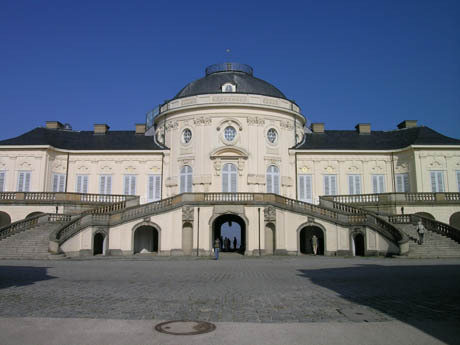 Ludwigsburg and Solitude castles are linked by Solitudeallee, each palace is also aligned on its own axis of symmetry. When O'Donnell looked at these lines in satellite view, it became clear that there was a third axis, emerging from the forest, which was missing a castle. Ingeniously, O'Donnell's proposed site for Bloodline means that our barbecuing hero, standing in front of the grill-window on the southwest-facing side of the pavilion, is the only person in their party who can see that they are actually inside the missing third castle. 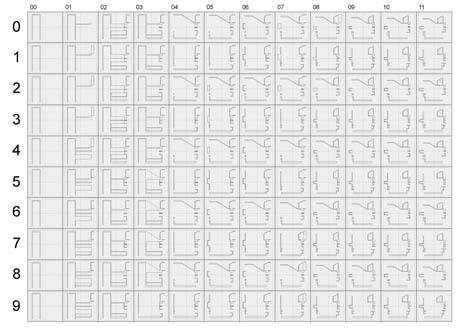 [Image: Plotting the axes and intersections of Ludwigsburg and Solitude: O'Donnell explained that "only the forest is missing a castle"]. In other words, while their friends and family relax in the grounds outside the pavilion, eating sausages they haven't had to prepare, "only the servant (or grill-master) will know the truth," explains O'Donnell, "although they can sneak others in, to share the secret." 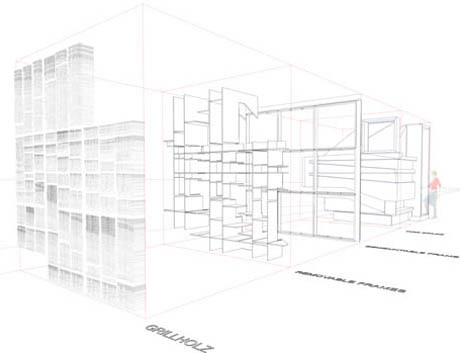 [Images: (top) Renderings of Bloodline show the grill-window and entrance; (bottom) Bloodline interior, looking out toward the grill-window's privileged view]. In terms of grilling experience, the barbecue pavilion that becomes a secret, personal castle seems second to none. "After that, the sausages are not my responsibility," O'Donnell told me. "There are however custom spaces built into the pavilion on the west side for a fire-extinguisher and a fire-blanket, as well as a big vent on the east side that aligns with the prevailing wind and uses the stack-effect to ventilate the space naturally." A couple of thoughts immediately come to mind here: firstly, that this is the perfect Father's Day gift. After all, doesn't every red-blooded male secretly crave his own barbecue castle: a private space of solitude, unspoken power, and burger perfection? Lowe's or Homebase could even stock build-your-own kits, for an extra DIY frisson. [Image: (left) Inside Bloodline (the server has clearly snuck in a few friends); (right) Stacked grillholz will form the façade and the barbecue fuel. The wood sticks' color even matches the ochre putty exterior of Schloss Solitude]. I'm also reminded, via a link that was (coincidentally?) sent to me separately by Caroline O'Donnell, of Harvard anthropologist Richard Wrangham's theory that cooking is the root cause of human civilization. His basic idea is that the discovery of cooking allowed us to unlock many more calories in food, which gave us more energy for less effort, which in turn resulted in a massive increase in brain size in Homo sapiens (as compared to our primate ancestors). [Images: Stages of consumption. At the end, all that will remain is the ash bench (bottom right), which O'Donnell plans to leave on site once the summer is over, "as a clue to the missing castle"]. That expanded brain of course led, eventually, to the flowering of the Baroque, in which rococo pleasure palaces were cleverly designed to hide any evidence of cooking facilities. O'Donnell's pavilion gives cooking its due once again, as over the course of the summer Solitude's missing third palace is revealed to be a a functional fire-space, rather than the abstracted perfection of a symmetrical cube. Barbecuing German day-trippers will thus be paying inadvertent homage to the role of fire in human civilization. [Image: Some of O'Donnell's incredibly complex cut files for fabrication]. 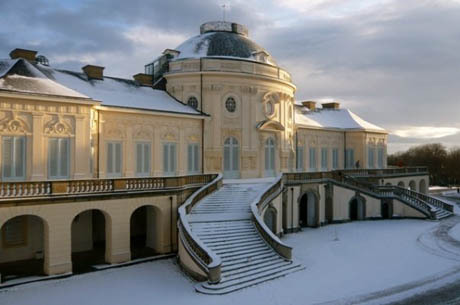 Caroline O'Donnell is working with Akademie Schloss Solitude to secure funding for the pavilion: the hope is to install it during the summer of 2011. My thanks are due to her for an incredibly interesting conversation, and also to Nathan Friedman, who has been working on Bloodline with O'Donnell for the past few months. This is such a gorgeous little project. Sehr klug! what a project! i`m from romania, currently studying at one of our biggest universities from across our contry, we`ve made some architecture projects in our classes but... this is... fantastic. i`ll come back tomorrow and try to post some of our projects. congrats!